Needing something new, I designed this new necklace this morning. I love it. Hope you do too. Just leave a comment and be entered to win. I just love your jewlery. You are so creative. I thought the necklace with the picture was the cutest and now you bring this out!!! So cute!! And I can't wait for you to add the birthday party items to your store, the party was to die for!!! like I need another one haha! I just want you to know YOU ROCK and love ya! Wow! I ♥ this necklace! Actually, I've got a few bookmarked that I like and I was just coming to browse again and see if I could make up my mind...now you go and make the decision even harder! :) Maybe I'll win one and can buy another!!! Who is the second anonymous commenter ????? I swear I am buying one for my wife with my sons names on it. Promise. You're very talented Kristy and your daughters are beyond gorgeous...would you consider my boys as their future husbands? FABULOUS... I love the open look to it. Rock on, girl! Oh, that is too cute, I'd love to win this for my daughter. My email is on my blog profile. 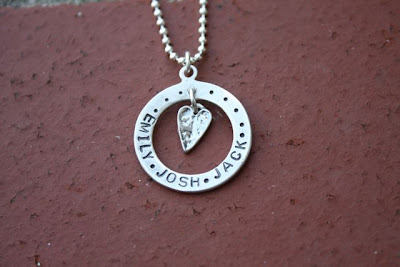 Looking forward to receiving my Joy pendant! I checked out your site.. you are very talented and I love your work! Pick me please??! !